Resolved: The United States ought to replace the Electoral College with a direct national popular vote. For the April Public Forum topic students can research the history, politics, and incentives created by the Electoral College system. The U.S. was founded as a republic and the Electoral College helped small states maintain influence. Without an Electoral College, few Presidential candidates would bother making multiple trips to Iowa and New Hampshire each election cycle. But maybe that would be a good thing. Should Iowa farmers and New Hampshire coffee shops have such an outsized role in each Presidential election? Consider the tens of millions of Republicans in California and Democrats in Texas who had no voice or impact in the recent election. Presidential candidates and their campaign managers knew California and Texas mattered only for raising campaign funds, so focused their time and money on swing states instead. In what sense do Texas and California voters give their consent to Presidential elections if their votes won’t matter in the winner-take-all Electoral College system? This is a big part of the reason why anything beyond two party system is guaranteed to fail in the Electoral College system. More candidates would earn Electoral votes, but none of them would meet the threshold to become president. We would need to switch to instant-runoff voting (or similar) in order for candidates to achieve a majority of support. A problem with judging the direct election of the President alternate, or a split Electoral College system, by the last election is that if the rules were different the campaigns would have been different. The Presidential campaign teams focused their money, time, and ground game on winning key states to win the Electoral College. They didn’t focus on the popular vote, so spent less time with campaign stops and rallies in Texas, California and New York. Nearly 67 million people live in California and Texas, or nearly 1/5 of total US population. With New York/New Jersey population of 29 million added, nearly 100 million live in these four states, approaching 1/3 of US population. With direct popular vote Presidential campaigns would like focus their efforts in big population centers in New York/New Jersey, California, Texas, Florida, and other big states. But that’s where the people are. 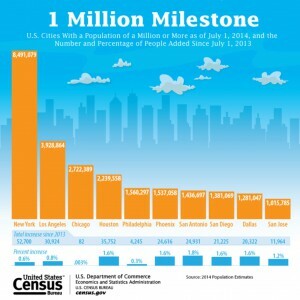 The U.S. Census report lists ten largest US cities. This mismatch between the electoral and popular votes came about because Trump won several large states (such as Florida, Pennsylvania and Wisconsin) by very narrow margins, gaining all their electoral votes in the process, even as Clinton claimed other large states (such as California, Illinois and New York) by much wider margins. Trump’s share of the popular vote, in fact, was the seventh-smallest winning percentage since 1828, when presidential campaigns began to resemble those of today. An additional rationale for the Electoral College was to check populist enthusiasm that the Founders feld majorities were susceptible to. The Constitution says nothing about the people as a whole electing the president. It says in Article II that “Each State shall appoint, in such Manner as the Legislature thereof may direct, a Number of Electors.” Those electors then vote for president and vice-president. They can be selected “in such Manner as the Legislature thereof may direct.” Which is to say, any way the state legislature wants. In 14 states in the early 19th century, state legislatures chose their electors directly. The people did not vote at all. Many online posts and articles can be found defending the Electoral College system as well as advocating replacing it with direct popular elections. However, Public Choice economists tend to focus on a different problem, one of rational voter ignorance. Trump owes his victory to the uninformed. But it’s not just Trump. Political scientists have been studying what voters know and how they think for well over 65 years. The results are frightening. Voters generally know who the president is but not much else. They don’t know which party controls Congress, what Congress has done recently, whether the economy is getting better or worse (or by how much). Public choice economists note that people are more likely to research new cars or smartphone because their “votes” matter in the quality and functions of the cars and smartphones they end up with. Not so with politics. How all of us vote, collectively, matters a great deal. But how any one of us votes does not. Imagine a college professor told her class of 210 million students, “Three months from now, we’ll have a final exam. You won’t get your own personal grade. Instead, I’ll average all of your grades together, and everyone will receive the same grade.” No one would bother to study, and the average grade would be an F.
Roughly a third of American voters think that the Marxist slogan “From each according to his ability to each according to his need” appears in the Constitution. About as many are incapable of naming even one of the three branches of the United States government. Fewer than a quarter know who their senators are, and only half are aware that their state has two of them. 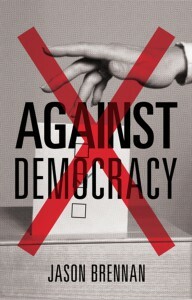 Amazon link to Against Democracy (Princeton University Press, 2016), with free “Look Inside”.